Red Mill House - Daintree Birdwatching: Last of the "Dry Season"
Last of the "Dry Season"
An unusual December in tropical Daintree with humid and warm weather but without the build-up of storms to date. Conditions are dry, leaves are falling, wetlands are shrinking and birds are seeking what water they can find. Even muddy, cow-filled ponds are attractive to some. Large numbers of Magpie Goose are feeding in the fields on the banks of the Daintree River and passing overhead the village each morning and night as they roost along Barratt Creek. Their presence is not going un-noticed by at least one of the local Crocodiles! 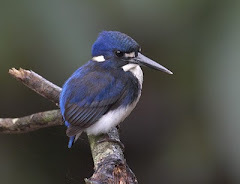 Great bird sightings in Daintree including a nesting Papuan Frogmouth with chick on Stewart Creek Rd, Cicadabird, Buff-breasted Paradise Kingfisher, Oriental Cuckoo, Great-billed Heron, Azure Kingfisher and many more. In the gardens at Red Mill House a large Terminalia is fruiting, proving very popular with Australasian Figbird, Eastern Koel and Pied Imperial-Pigeon. A fabulous time of year for frogs, and therefore snakes. Guests shared the swimming pool with this delightful Common Green Tree-Snake last week, who just missed his frog. 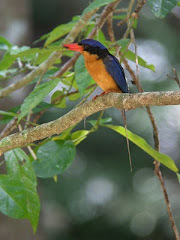 The rains will come soon enough - for now we are enjoying the wildlife treats that we have.